BOOM! Studios and Cartoon Network Enterprises announce ADVENTURE TIME/REGULAR SHOW, a comic crossover adventure that’s anything but regular. The six-issue limited series launches in August and will bring together the casts of the two hit Cartoon Network series into one story. When a powerful new villain threatens to conquer Adventure Time’s Land of Ooo, Princess Bubblegum sends Finn and Jake on a desperate quest to find The Power that can save the land—a power that Skips from Regular Show just happens to be hiding! Finn and Jake’s arrival only exacerbates an existing tension between Mordecai and Rigby, and the trip back to Ooo threatens to tear two sets of bros apart… forever. 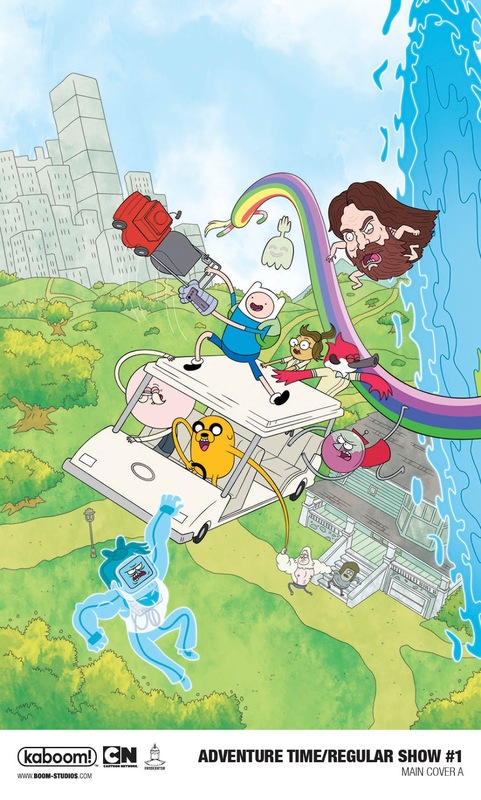 Written by Conor McCreery (Kill Shakespeare) and illustrated by Mattia Di Meo (Uncle Grandpa), Adventure Time/Regular Show marks the first-ever crossover between the two properties, a fact that’s not lost on the creative team. “When you get the opportunity to put your little flag into the surface of not one, but two of the greatest story worlds in recent history, you gotta say yes!” exclaims McCreery. “I'm excited, terrified, tickled, and tormented by all the amazing characters and storylines that could go into this crazy thing. Adventure Time and Regular Show are special to me because of the combination of out-of-left-field humor and really deep emotion. I'm going to try to honor those twin engines as best I can with a story that has a LOT of weird stuff, a whack of battles, a few tears, and at least one incidence of Ice King being a patoot." “Being a super-fan of Adventure Time and Regular Show, this is really like a dream for me,” adds Di Meo. “I know it sounds kinda weird, but it feels just like being in love for the first time—that peculiar mixture of deep enthusiasm, and deafening emotion. Jokes aside, I want to deliver that special magic that those series always had for me. That sense of fun, adventure with that special levity that made all those stories special for me. Through its award-winning all-ages imprint KaBOOM!, BOOM! Studios began publishing Adventure Time comics in 2012 and Regular Show comics the following year. Both comic series went on to break sales records for all-ages comic publishing. 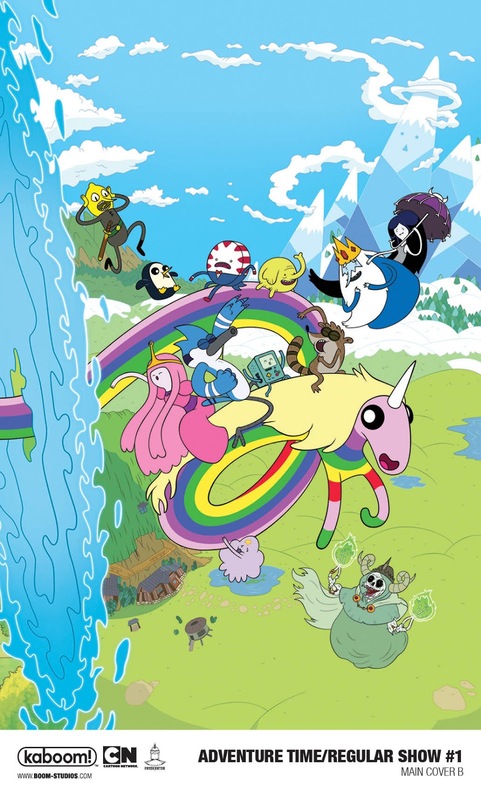 From the mind of series creator Pendleton Ward, the Emmy and Peabody Award-winning Adventure Time follows the unlikely heroes Finn and Jake, best buddies who traverse the mystical Land of Ooo and encounter its colorful inhabitants—and always find themselves in the middle of heart-pounding escapades. Created by J.G. 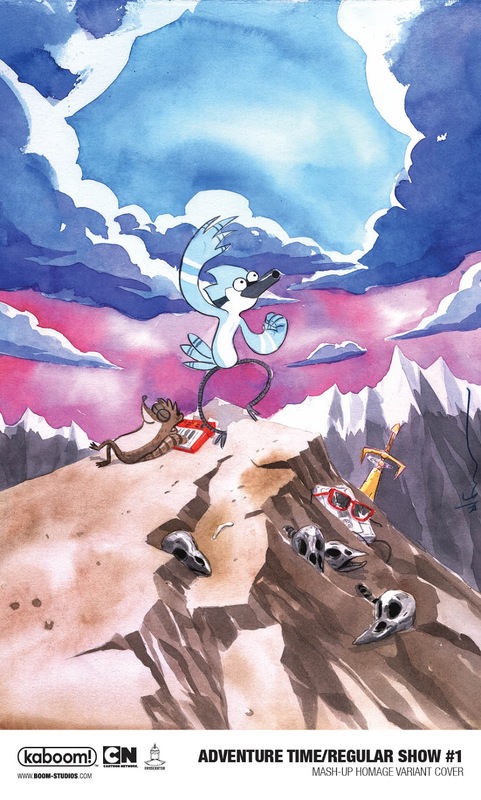 Quintel, Regular Show chronicles the adventures of Mordecai, a blue jay, and Rigby, a raccoon, a couple of best bros in their 20s who work as groundskeepers at a local park—but would rather chill out for a bit. Print copies of Adventure Time/Regular Show #1 will be available for sale at local comic book shops (use comicshoplocator.com to find the nearest one) or at the BOOM! Webstore in August. Digital copies will be available to purchase on digital book marketplaces, including ComiXology and the BOOM! Studios app. 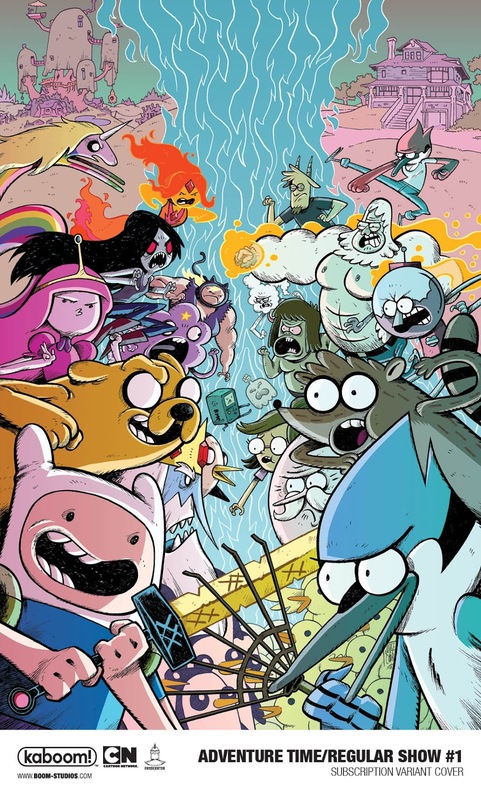 Adventure Time/Regular Show is the latest release from BOOM! Studios’ critically acclaimed KaBOOM! imprint, publisher of world-class licensed series such as Steven Universe, Over the Garden Wall, Peanuts, and Garfield, along with original series like Brave Chef Brianna by Sam Sykes and Selina Espiritu, and The Deep by Tom Taylor and James Brouwer. For news on Adventure Time/Regular Show and more from BOOM! Studios, stay tuned to www.boom-studios.com and follow @boomstudios on Twitter.